How Do I Stack My GE Washer & Dryer? How Can I Stack My Front-Loading Washer & Dryer? Stackable Maytag washers and dryers allow you the versatility of full-size machines with the space advantage of compact machines. Maytag offers many different front-load washers and dryers in all capacity sizes that will easily stack in a small laundry room. It is not too difficult to install a stackable Maytag washer and dryer if you follow the appropriate procedures. Stack your Maytag washer and dryer to save space. 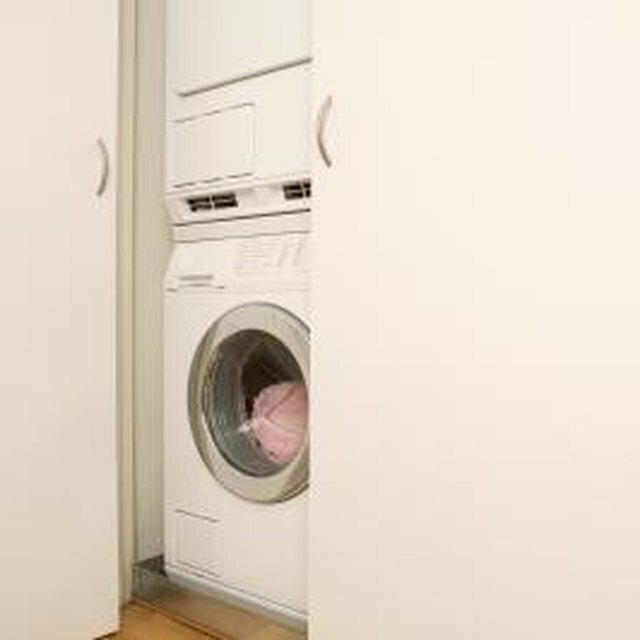 Measure the area where you will install your stackable Maytag washer and dryer for the required clearance. Verify that you will have at least 1 inch or more between the wall and each side of your washer and dryer. You will need at least 12 inches of clearance from the top of your unit to the ceiling and 5 1/4 inches of clearance from the back of the unit to the wall. If installing in a closet, the closet door must have air vents at the top and bottom of the door. Verify that your washer is level. Lay a level on the top of the washer and adjust the leveling legs of the washer up and down by turning them with your hand until the unit is level. Clean the top of your washer with an all purpose cleaner and a soft cloth to remove any dirt and dust. Dry the washer with a soft cloth. Locate the plastic covers for the dryer feet attached to the stacking kit. Twist or cut them from the stacking kit and set them aside. Place the stacking kit onto the top of the washing machine. Position the kit so the back of the stacking kit sits against the back mold line on the washer. The washer has a recessed area molded into the top of the washer. Make sure that the front of the stacking kit is located at the front of the washer. Remove the cover from the double-sided tape located on the bottom of the stacking kit and press down firmly. Install seven of the nine sheet-metal screws provided with the stacking kit. Use a drill to drill the screws through the screw holes located in the kit and into the top of the washer. Lower the leveling legs onto the dryer until there is only 10mm of space between the base of the dryer and the top of the leveling legs. Lift and push the dryer onto the top of the washer. Slide the dryer leveling legs into the slots on the stacking kit, pushing the legs all the way back into the slots. Drill 3/32-inch pilot holes at the front slots holding the leveling legs of the dryer. Drill the holes directly above the locator tabs on the stacking kit and partially through the leveling legs of the dryer. Install the remaining two screws from the kit completely through the dryer legs, tightening the screws to secure the dryer into place. Cover the front dryer leveling legs by installing the plastic covers you removed from the kit in step four. The covers will install from the sides of the kit and slide in toward the center. Plug the washer and dryer into the wall outlets. Install the dryer vent from the dryer to the vent located in the wall. Slide your stackable Maytag washer and dryer into its final position.